Provost Claire Sterk and SGA President Raj Patel listen intently to His Holiness the XIV Dalai Lama's lessons. Emory Photo/Video. His Holiness the XIV Dalai Lama stepped into his role as Presidential Distinguished Professor with both humor and humility. Emory Photo/Video. "Secular Ethics 101" in Glenn Memorial Auditorium included a Q&A session with students. Emory Photo/Video. 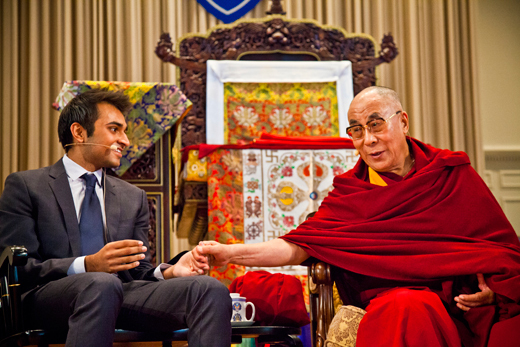 "It was very definitely an experience I'll never forget," says SGA President Raj Patel of the opportunity to converse with the Dalai Lama. Emory Photo/Video. 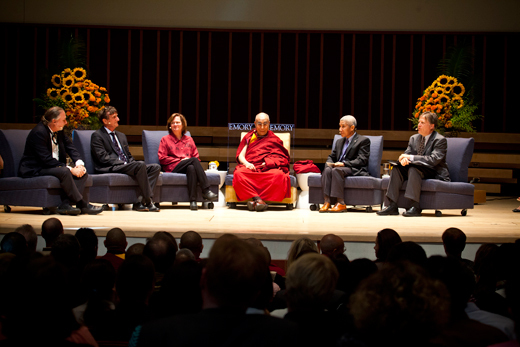 President James Wagner moderated the discussion as the Dalai Lama delved into topics of science, morality, religion and ethics. Emory Photo/Video. Faculty panelists gather in the Schwartz Center for "Transcending Moral Differences: Can a Secular Ethic Unite Us?" Emory Photo/Video. Professor Philippe Rochat called his experience as a faculty panelist "inspiring" and "full of pleasant surprises." Emory Photo/Video. 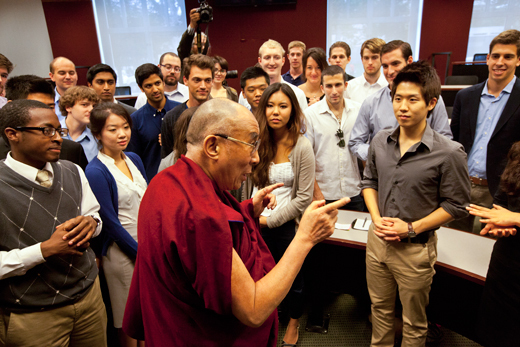 Despite an international stature, the Dalai Lama proved to be an accessible teacher, creating frequent moments of connection with students, faculty and staff across campus. Emory Photo/Video. Students in Wesley Longhofer's "Business and Society" class welcomed a special guest lecturer. Emory Photo/Video. The visit of His Holiness the XIV Dalai Lama concluded with a Buddhist Teaching. Emory Photo/Video. The professor wore robes of scarlet and gold, teaching with a voice that rarely rose above a gentle conversational pitch. But his lessons were woven with moments both intellectually challenging and surprisingly light-hearted as he delved into topics of science, morality, religion and ethics. And when he spoke, hundreds leaned in to listen. 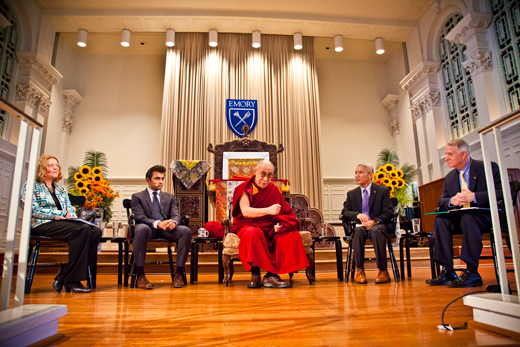 His Holiness the XIV Dalai Lama came to Emory for a three-day visit this week — an event framed by an ambitious schedule of lectures and seminars, cultural celebrations and academic exchanges. And wherever he went — from auditoriums to sanctuaries to quiet backstage spaces — he created a classroom. The week marked the third trip to Emory for the Tibetan spiritual leader as a Presidential Distinguished Professor. And he stepped into the role with both humor and humility, at times dismissing himself a "hopeless professor" who had himself been lazy about doing homework when he was a student. As an internationally recognized thought leader and esteemed spiritual authority, the Dalai Lama was indeed an uncommon professor — it isn't every educator who has the power to fill the Gwinnett Arena, the rock star charisma to inspire both fans and T-shirts, and requires a security detail to walk across campus. But despite an international stature, he proved a very accessible teacher, creating frequent moments of connection and exchange with students, faculty and staff across the campus. The first time that Student Government Association President Raj Patel heard the Dalai Lama speak was as a high school senior in Indianapolis, Ind. 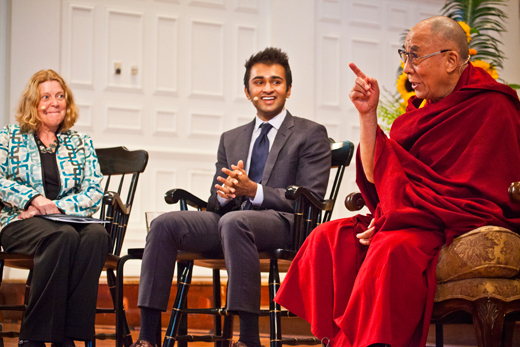 This week, the Emory senior found himself sitting beside the Dalai Lama before a crowd of hundreds packed into Glenn Memorial Auditorium for a presentation entitled "Secular Ethics 101." As Patel formally welcomed this distinguished professor on behalf of all Emory students, he shared a personal story: Hearing the Dalai Lama speak about the shared commonalities of world religions three years ago had opened his eyes, leading to Patel to take his first religion course at Emory and ultimately, choose religion as one of his majors. As the 78-year-old spiritual leader began to speak on the importance of teaching secular ethics — a universal system of ethics not bound to any particular religious tradition — Patel sat in "probably one of the biggest classrooms I've ever been in" experiencing one of those "'is this really happening" moments. Looking up, he found the Dalai Lama studying him intently, then reaching over to squeeze Patel's hand in a gesture of support. "It was definitely an experience I'll never forget," Patel recalls. "I felt the same type of energy from him that I felt three years ago — his energy was so strong, I'm sure the audience all the way in the back could feel it." Slipping into the role of student, Patel listened to the Dalai Lama describe how humanity is facing a moral crisis — from suicide bombers to mass killings in Syria to religious conflict. When we hear of these things, it's sometimes easy to remain indifferent, the Dalai Lama said, adding, "I think that's also immoral." Since there will never be one accepted world religion — and even religious leaders can be corrupt — the answer won't necessarily be found in a church or temple, the Dalai Lama said, but rather in the classroom. "Education is universally accepted, even in countries that are against religion," he explained, stressing that teaching secular ethics "respects all religions and quite wisely also respects the non-believer." "Actually, I believe that secular ethics is the basis of all religions," he added. The session concluded with an exchange with a handful of Emory students, who stood to ask the Dalai Lama challenging questions: "Economists often disagree about the distribution of wealth," said Emory junior Scott Parent. "What constitutes an ethical economic system?" "…and you have 10 minutes," quipped Emory President James Wagner, who was moderating the discussion. Laughing, the Dalai Lama responded: "I am the wrong person to ask such a question. If I was in the position to make those decisions, I think it would (all) collapse." But he added that the question underscored the role of individuals in ethical decision making. "No matter the system, the individual makes the difference," he observed. And so it went, a thoughtful exchange between a teacher and his students. Senior Rebecca Berge wanted to know "what it meant to be useful" in life. Graduate student FikreJesus Amahazion wondered how leaders, groups and society "can form guidelines that respect the foundations and perspectives of others." Junior Edmund Xu asked about the ethics of the prison system. Each time, the Dalai Lama paused to consider the weight of the query, frequently formally outlining the pros and cons of each argument — a rare opportunity to witness the mind of the Buddhist leader at work. Afterward, Xu acknowledged that though his legs were shaking as he stood to ask his question, he immediately felt at ease. "It was definitely thought-provoking and really inspiring to be sitting there thinking about how you can apply these things to your own life," Xu said. For Amahazion, "the biggest thing was how humbling it was — it reinforces my thoughts about the goodness of humanity." To Parent — who admits he "ran around the room screaming" when he first opened an email inviting him to pose a question to the Dalai Lama — "it was just a great, great experience," he said, beaming. 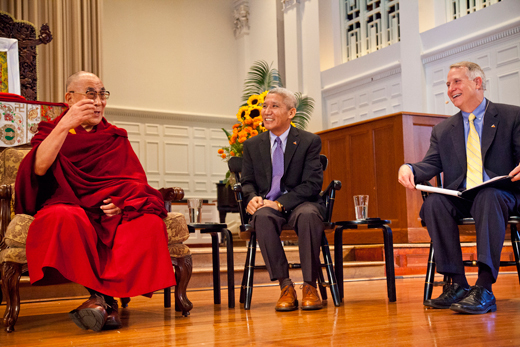 Later in the day, the Dalai Lama joined Emory faculty — scholars of religion, ethics and psychology — for a panel discussion on "Transcending Moral Differences: Can a ‘Secular Ethic' Unite Us?" Using the Dalai Lama's book, "Beyond Religion: Ethics for a Whole World" as a focal point, Moderator Paul Root Wolpe, director of the Center for Ethics, explained that the spiritual leader's writings advance the goal of uniting believers and non-believers around a common "secular ethic" based upon Buddhist concepts of awareness, discernment and compassion. Sitting on stage in discussion with the Dalai Lama, all participants acknowledged the deep honor of delving into this kind of scholarship — this was not a normal day at the office. 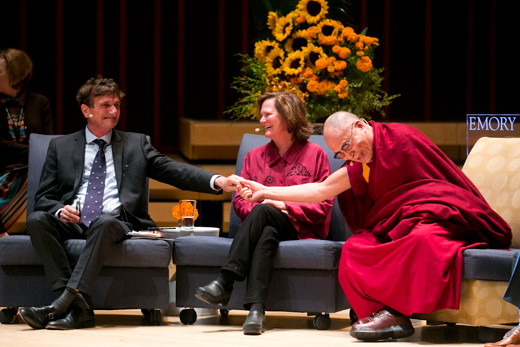 Wendy Farley, a professor of religion who has used the book in her own classes, asked the Dalai Lama about how to help her students make the leap from learning about the ethic of compassion to actually implementing it in their own lives. "To have an ethical vocabulary is wonderful," she said. "But how do you stand in the fire?" Before presenting his own questions, Professor of Psychology Philippe Rochat acknowledged that he had spent days reading the Dalai Lama's book and watching YouTube interviews to refine his query. Though a welcome opportunity, it was a bit intimidating: "I knew I was encountering someone who was larger than life," he said. But the experience was full of pleasant surprises. When Rochat asked about the propensity for good and evil in human nature, the Dalai Lama asked a few questions of his own, paused and smiled graciously. "… I don't know," he responded playfully, with a good-natured shrug. It wasn't the end of the conversation by any means, and for Rochat, an admission that he didn't have all the answers was inspiring. "That was a powerful moment — he's an honest man," he said. "On an intellectual level I learned a little bit more about the Tibetan perspective," Rochat said, adding that he is now inspired to visit. "It would be very interesting to study children in this compassion-driven culture." For Edward Queen of Emory's Center for Ethics, the opportunity to have a scholarly exchange with the Dalai Lama was the realization of a long-held dream. "I've been waiting 47 years for this moment," Queen said. "At the age of 7, I remember sitting on the floor of my parent's house. I pulled out a Reader's Digest Condensed Book and it was the story of the invasion of Tibet and this young boy who led the country at that time…"
Queen went on to ask: "What would be your response to a person who rejected the fundamental claim that there is a common humanity?" 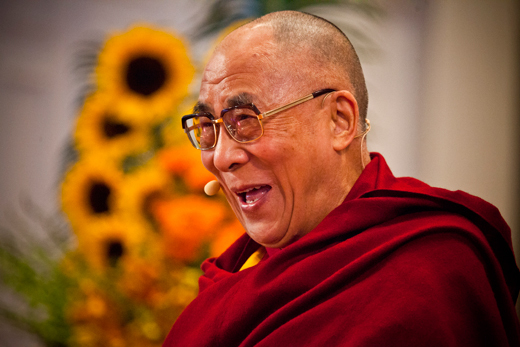 Smiling, the Dalai Lama recalled a line in an 8th-century Buddhist text that, roughly translated, states: Not even the Buddha is going to please everybody. Looking back, Queen reflects on the session as a thrilling exchange. "For my purposes, he gave me the answer to the question I was looking for," Queen said. "We don't necessarily have to wait until everybody is in agreement, but there are enough people of goodwill who are not necessarily saints or cosmic sinners who can take these principles (of secular ethics) as a basis of working together." 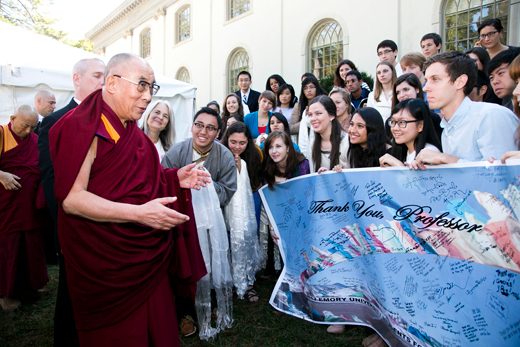 For Emory, he added, the impact of the Dalai Lama's teachings on campus is valuable "on so many levels." 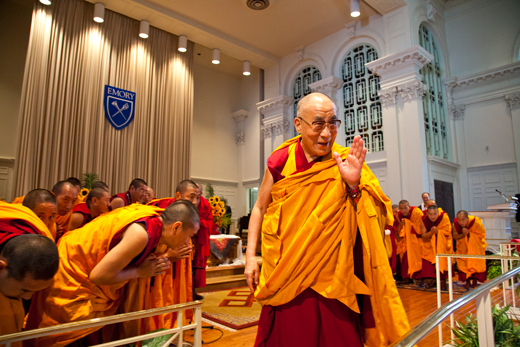 "The presence of His Holiness on the Emory campus is not just about entertainment and showmanship. His presence as a faculty member really is about the University's intellectual and educational work," Queen said. "I hope that was something the audience took away — that serious individuals can engage in intellectual disagreement with the shared goal of coming to some approximation of, for lack of a better word, the truth," he said. Emory professor Wesley Longhofer remembers studying concepts of detachment and discernment in his college Buddhism class — lessons he still finds valuable even now as an assistant professor of organization and management at Goizueta Business School (GBS), helping students explore ethics and business. "I was a religion minor," Longhofer explained. "Detachment is the idea that we shouldn't allow negative emotions to take over, we should remain peaceful and compassionate. Discernment is a part of compassion — understanding how your actions and behavior affect humanity through critical thinking." So the chance to have the Dalai Lama engage in some "critical thinking" with students in Longhofer's "Business and Society" class — one of two classes that he met with this week — "was extraordinary." "The class deals with such topics as ethical consumerism, fair trade and corporate philanthropy," Longhofer said. "Given the topic, I can't think of anyone better to participate." "He is such a compassionate and peaceful individual," Longhofer added. "Much of what he talks about is the ethics of the individual. A class like ours thinks about the ethics of corporations, but a lot of his logic we can apply to corporations. Our decisions as a business, is that in the best interest of humanity or just our business?" Unlike earlier appearances, the setting was intimate. Students rose and stood silently as the Dalai Lama entered the lecture room; he quickly dispensed with formalities. "In the classroom," he assured them, "I always feel I am one of the students." Knowing that his time with them was short, Longhofer's students had worked together in advance to design questions that would have meaning in their personal and professional lives, explained Ariella Sela, a senior in sustainability management. Is competition in the business world compatible with compassion? And can personal values align with professional success? Is it possible to change a corporate culture from within? Has technology made us more self-centered? Weighing each question, the Dalai Lama pointed out that the morality of any profession comes down to personal responsibility, motivation and conduct. In running a business, he advised, "transparency brings trust, trust brings cooperation." And while the spirit of competition is not bad — it can fuel advancements — creating obstacles for others in the name of competition is contradictory to the spirit of compassion. When confronting moral questions in the business world, he advised, it all comes down to "your own responsibility. So study, analyze, think, think, think … and then decide." Afterward, Longhofer said the experience was "phenomenal." "We've talked so much about what corporations can do to protect human rights, improve the environment, address child labor — all these deep, moral issues. For him to give clarity is just wonderful," said Longhofer, who reported receiving numerous emails from students grateful for the experience. For Patrick McBride, the visit had special meaning. "I took a business ethics class through the Philosophy Department my freshman year, and took this class because I thought it would be interesting to see business ethics from a business standpoint," explained McBride, a senior in information systems and operations management. He was not disappointed: "It brought my Emory education full circle, being able to take one topic and see it from two different perspectives," McBride added. "Then to have the Dalai Lama here, in an intimate setting, asking him questions that are really relevant to us — that's almost surreal." "Here is this spiritual leader who millions follow. And right now, if you go to (the Dalai Lama's) Facebook page, you'll find a picture of him here, with a class at Goizueta … that's really, really cool."